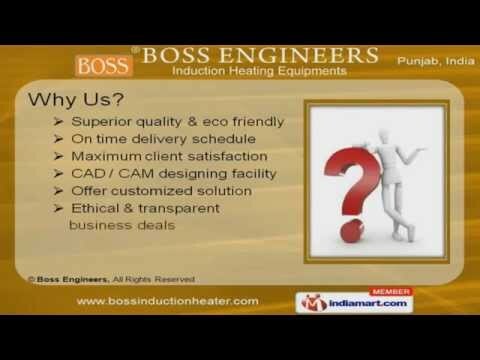 Welcome to Boss Engineers (Induction Heating Equipments)Manufacturer & Supplier of Induction Heating Equipments. The company was incorporated in 1988 at Ludhiana, with the Brand name as âBOSSâ. Effective after sales service & high grade raw material has helped us to gain clients across Indian subcontinent. Maximum client satisfaction, CAD / CAM designing facility, timeliness & customized solution are some of the key attributes of our organization. Our products find application in Automotive, Hand tool, Tube, pipe, Electromechanical, Forging & other industries. Titan Industries Limited, Ultra Tech Suspensions & J K Engineers are some of our esteem clients. High efficiency, Scaling free operation, Speed, Fast heating, Continuous working, Easy to handle and noise free operation are our quality parameters. We are engaged in offering Induction Heaters & Scanners. Along with that we offer Induction Heater radio frequency that are manufactured under expert supervision. Our Vertical scanner for 1. 5 m & 1 Meter job handling are a class apart.